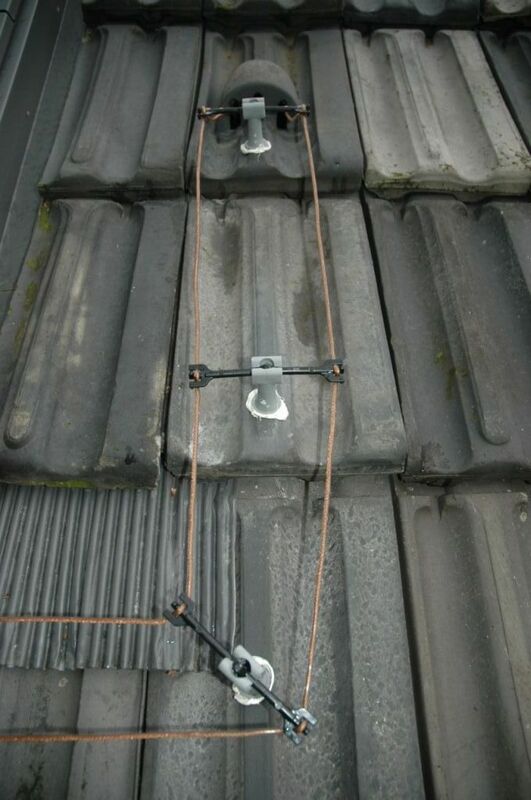 This DeltaLoop antenna has a length of 125 meters, divided into three sides of 40, 42 and 43 meters. The antenna is at a height of 10 meters. but at 160 and 80 meters is the antenna almost rondstralend. The wooden poles are "poles in the bark." Similar to very straight trees without branches. This type of poles is also known as pile. Below are the poles over 25 and the top is about 15 cm. The piles are a half meters in the (sand) ground. Here is how visible the antenna between the poles is tense. One of the three poles to which the antenna is confirmed. The high voltage of the DeltaLoop. 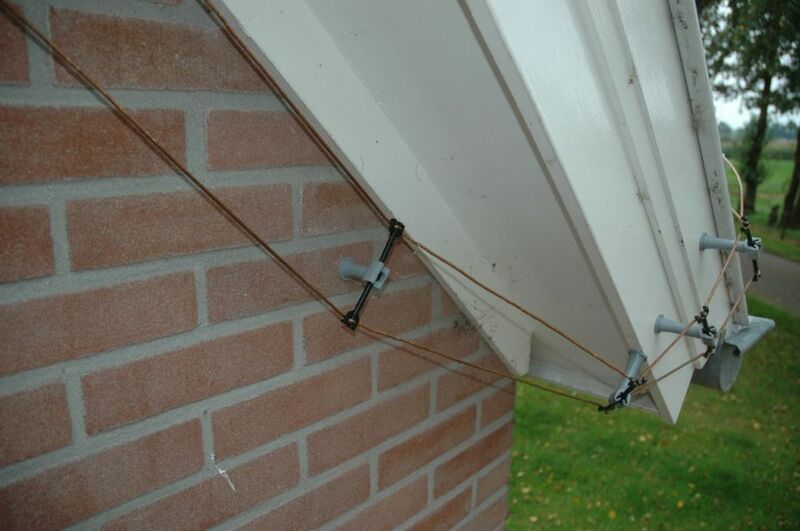 For the antenna and the open supply lines is the same 2.5 mm2 fosforbrons wire. 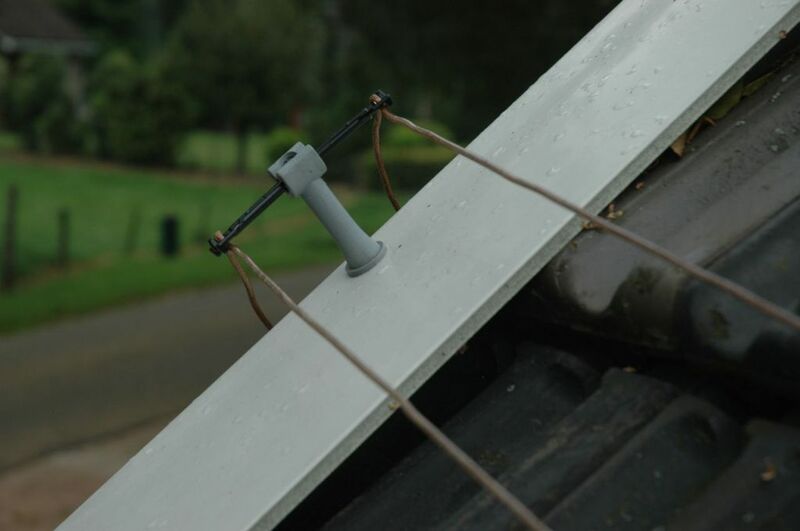 The glass Pyrex insulators are 30 cm long, as well as the steel springs. All other parts are of stainless steel, the katrol is part of plastic. The nylon cord is 5 mm thick and has a treklast of 450 kilos. 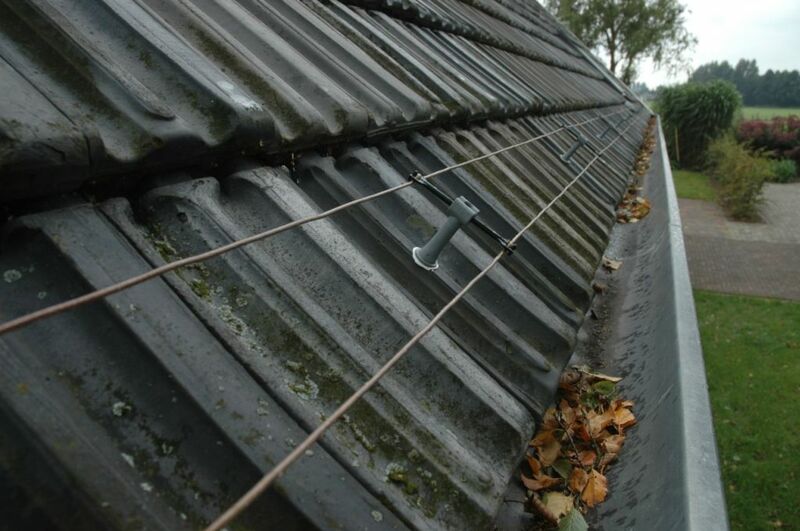 The open supply lines, over a distance of 17 metres from the power supply to the house. This is the confirmation of the open supply lines to the exterior of the house. Two keilbouten, musketonhaken, steel springs, stainless steel and glass Pyrex insulators draadklem of 9 cm long. Here again a strain relief. The same confirmation, but from the bottom photographed. The plastic spacers are manufactured by the German mark BS Technic from Durmersheim / Germany, type Nylon Duplo-Clip. 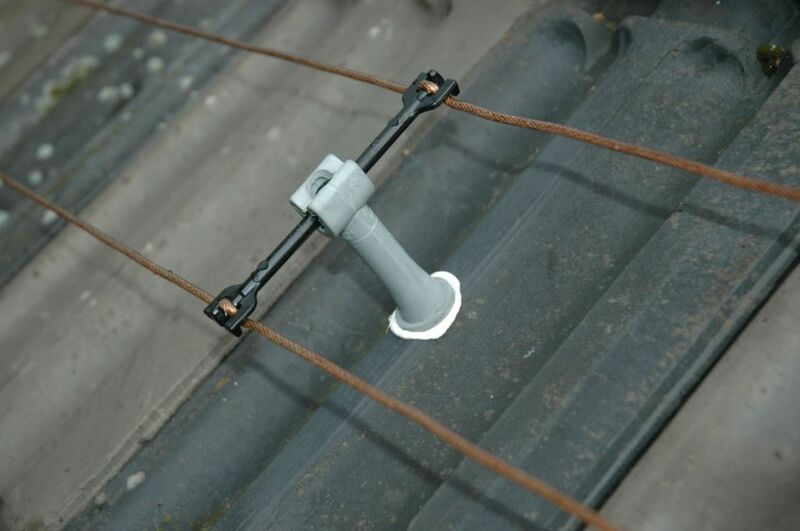 This 8 mm spacers are also known to use copper headed for bliksembeveiliging to terminals. I've bought them at Concrete Elshout, Albert Einsteinweg 19, 5151 DK Drunen, tel 0416 370067. At the front, the spacers a height of 4 cm. The spreaders are 12 cm long and are carried by www.hfparts.com, type SP-120. She clamps very well in the plastic spacers! 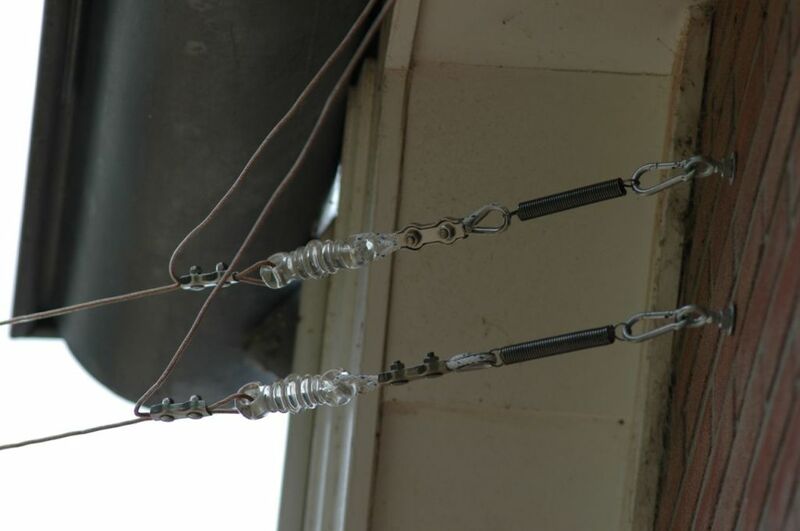 The spread between the two wires of the open supply lines is 11 cm. The spreaders have a hole in the middle which they also in some other way can be mounted. to the tiled roofs on the side of the house. This represents the same spacers used, but with a height of 6 cm. 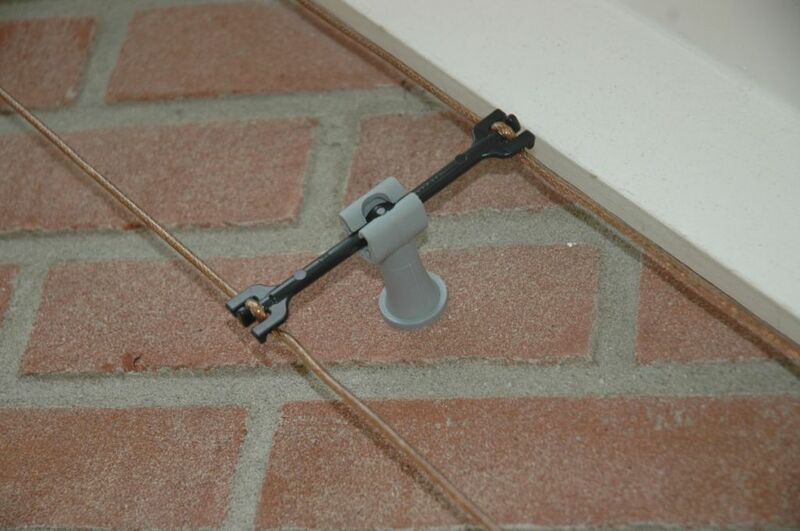 A 6 inch plastic spacer dakbeschot screwed down on the plastic on the side of the house. The 6 inch plastic spacer on one of the tiles. The tile is at the highest point (gently!) Drilled a hole of 6 mm. The tile in the place of the boring is good sandpaper and cleaned with a brush. In the borehole, a 6 mm plug on the brand Fischer type SX. Between the tile and the spacers is fitting; Bison Professional Polymax. 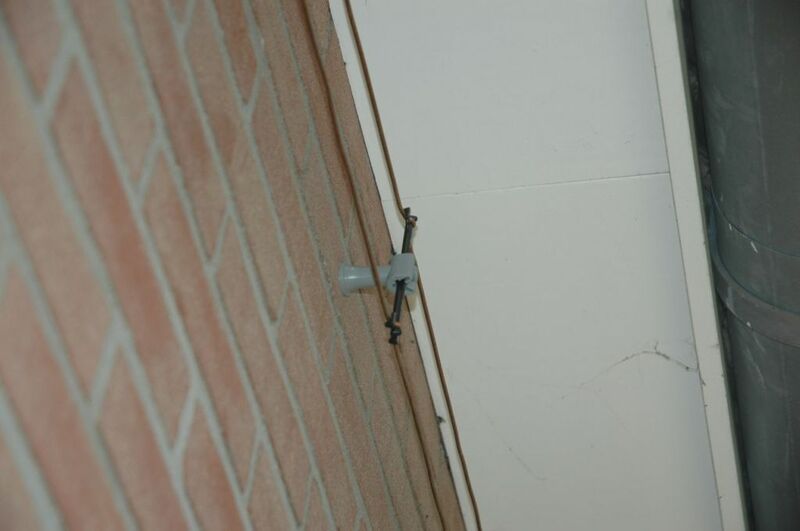 The spacer is then with a 4.5 mm stainless steel spaanplaatschroef on the tile fixed. The assembly may well open supply lines stretched tightly over the tiled roofs. 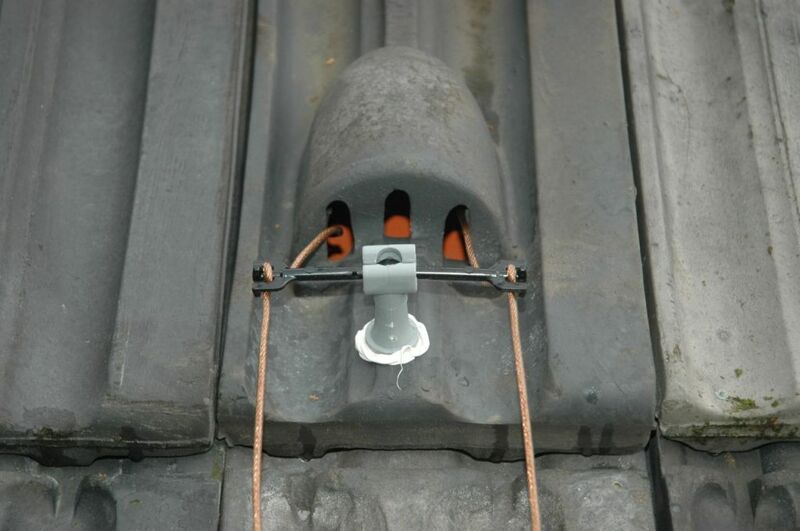 ventilationtile a direction with three openings. 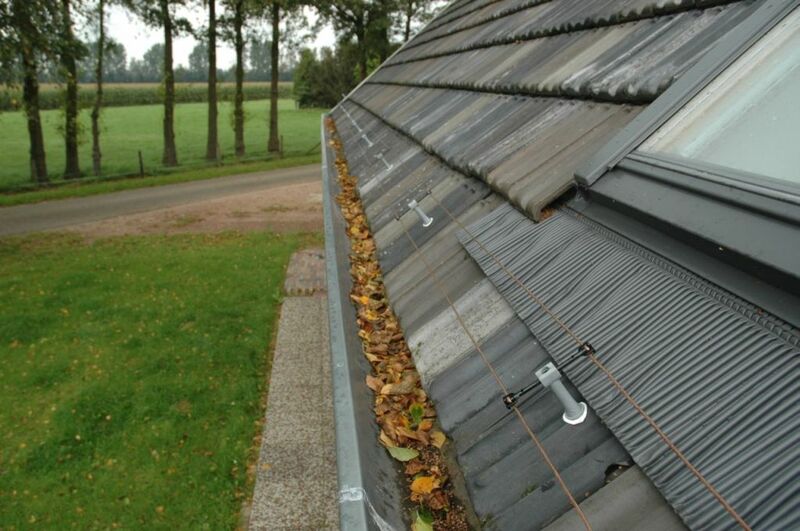 The open supply lines passes through the ventilationtile. than a hollow space and finally by a shack in the plasterboard. making the open supply lines to within its coverage. 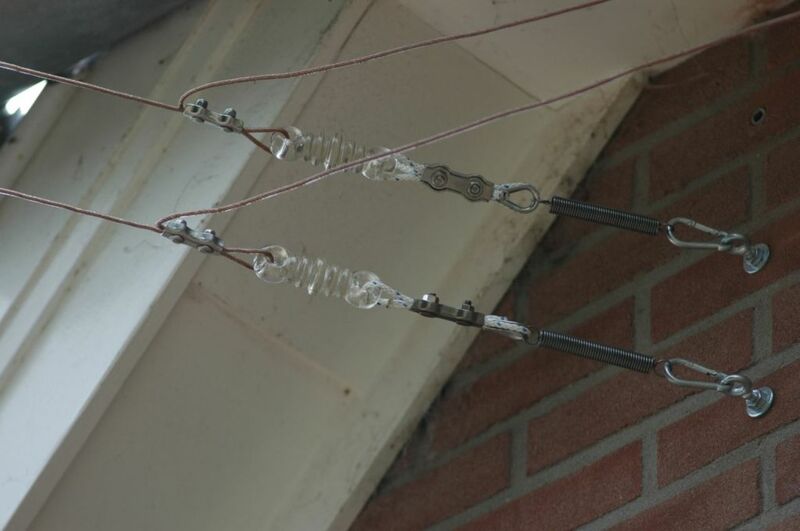 The results of this antenna are extremely good. About horizontal loops is very much written in books, magazines and on the Internet. When I give no answer, please send me a message.